One of the things that me and my colleagues have in common is our love for food. 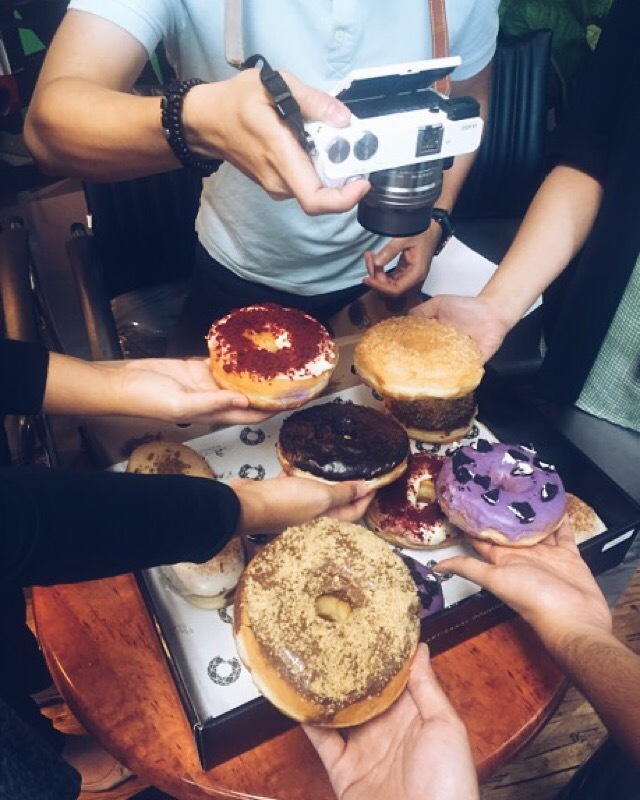 Since I moved to this team of 9, I’ve had countless of culinary trips in between meetings or during lunchtime.. and we also like to order food to be eaten together during work 😀 Last Thursday, one of my friends discovered Dough Darlings on Instagram – an online bakery based in North Jakarta – and she quickly gathered some of us to order a dozen doughnuts together. Since not all of us are fond of doughnuts, only 6 decided to order it, hence each could get 2 kinds. We went to their website to check their menu. They have a selection of flavours which looks very tempting, it felt like I want to buy them all! Really! Plus, their instagram feed is also as tempting. At first it was hard to decide.. but then I finally got a decision – I ordered 1 Red Velvet and 1 Nutella + Graham doughnuts. My friend organised the order to be delivered the next day – Friday. 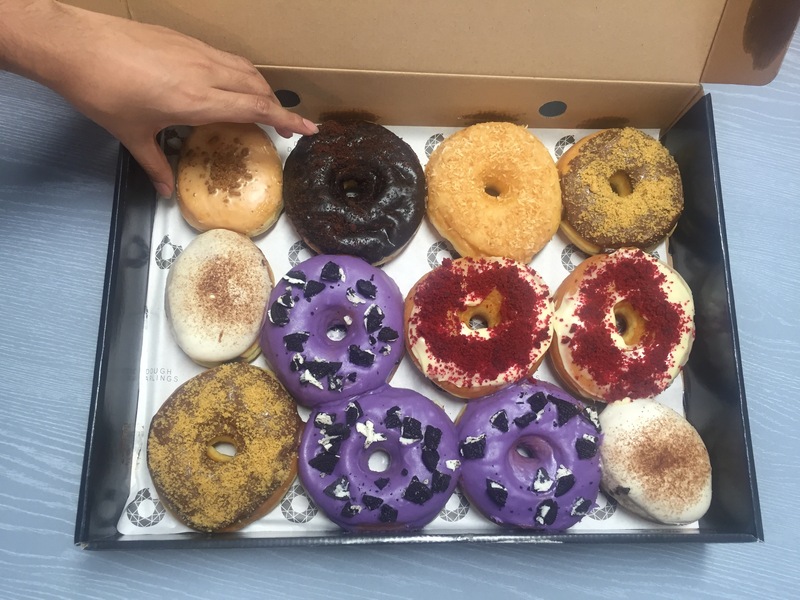 With the help of Gojek, our order arrived safely at the office shortly after lunch, just in time for dessert. The packaging looks promising and I could not believe what I saw when I opened the box! JUST. LOOK. AT. THOSE. GIANT. DOUGHNUTS!!! i want eating Donuts! yummy!!! And now you got me drooling and wanting to give this one a try. Aaakkk.. Ratjooen!! The very same thing happened when I read that croissant post. Haha. sepertinya cocok Chris buat foodblogger. 😀 racunnya efektif tuh. Hahaha. Gak usah dipikirkan soal fotonya Chris. Yang penting kan isi tulisannya. Oya konon kabarnya mereka suka ikut bazaar2 di mall gitu Nad..
Enak banget kayaknyaaa, kalo sama Dunkin Donut gede+tebelan mana mba? 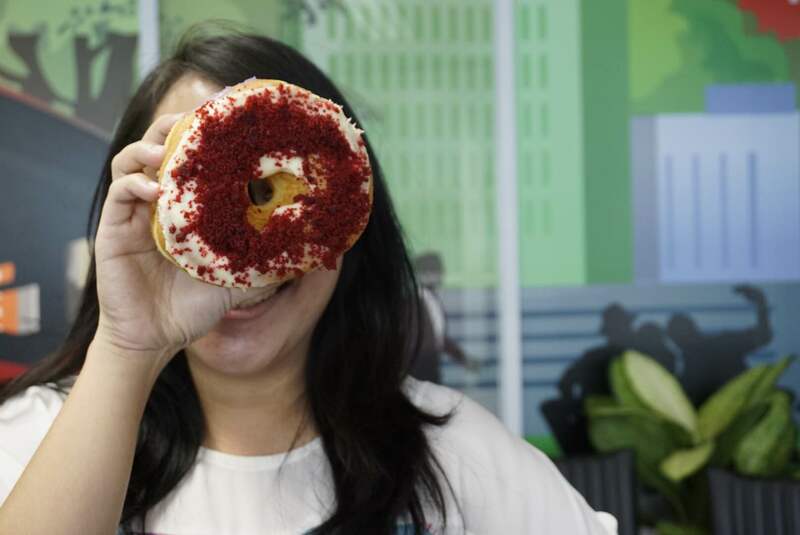 Kalo jco ama dunkin kan tebelan dunkin tuh..
Iyaa enak banget sekarang ada gojek, apa2 jadi lebih mudah hehe..
Btw theme blognya baru ya?